Like an unchecked oil spill, the toxic and oozing News Corp. scandal is staining the already less than stellar image of the rest of the press, too. On my semi-annual visit to friends and family in the Midwest, I was asked time and again how frequently American news media hack into the mobile phones of unsuspecting celebrities, politicians and crime victims. The answer, so far as I know, is hardly ever, if at all – because most newspapers couldn’t afford to hire technically savvy private eyes and because most television news directors are insufficiently imaginative to do anything more than train a camera on something that's burning as they are about to go on the air. The other reason that systemic hacking would not occur in the United States is that most of the mainstream media companies adhere to a reasonably well developed and widely shared sense of ethics that includes, among other things, the commercially prudent practice of obeying the law. This is not to say American journalists don’t play the angles from time to time. Reporters, this writer included, have been known to eavesdrop on unsuspecting individuals or read untended documents left casually in sight. Back in the day in Chicago, I felt duty-bound to join a gaggle of reporters who followed negotiators in a labor strike into the men’s room in hopes some news, among other things, would leak during the bio break. My alma mater, the Chicago Sun-Times, even went so far as to buy a bar in 1977 so it could surreptitiously film shakedowns by city inspectors to dramatize, to no one’s surprise, the petty corruption endemic among the payrollers. The secret project – which took place before I joined the paper – was denied a Pulitzer Prize because of the sting tactics involved in reporting the story. But at least no laws were violated. Even if the hacking scandal is found to be a problem unique to the wild and wooly News Corp. operation in the United Kingdom, it comes at a time that trust in the press is near an all-time low. Only 28% of Americans have confidence in newspaper and television news, according to a Gallup Poll released last month. This is down from the 39% of Americans who trusted newspapers when Gallup started asking the question in 1990 and down from the 46% of U.S. citizens who expressed confidence in TV news when Gallup started quizzing them in 1993. The erosion of trust in the American press is one factor in the steady decline of audience for both media. Waning confidence also has contributed to the sharp drop in newspaper advertising revenues in recent years – a calamity that likely will be visited on local TV as soon as Internet-to-television broadcasting is perfected. Accordingly, the News Corp. scandal is not merely a remote tragedy that couldn’t have happened to a more deserving guy than the arrogant and mercurial Rupert Murdoch. Because this story will be grabbing headlines for a long time to come, it is a clear, present and potentially growing commercial danger to American media companies. To counteract the damage Murdoch’s toxic journalism is doing, American media executives proactively need to tell their readers and viewers that this stuff isn’t happening here. Then, they need to spell out the policies and procedures they have in place – and whatever else they plan to do in the future – to make sure that it never does. And this self-serving diatribe in the Wall Street Journal is not what I would suggest. 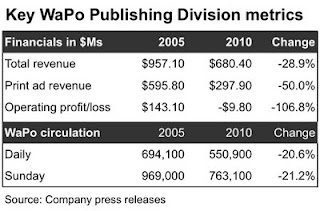 With newspaper ad sales falling at an unexpectedly abrupt rate, many publishers at mid-year were laying off staff, requiring unpaid furloughs, consolidating plants and taking other measures to buttress their bottom lines. Although some analysts have interpreted these expense-cutting tactics as a repudiation of the print newspaper business by publishing companies, they are anything but. Publishers have undertaken these measures in an effort to keep their traditional businesses as strong as possible to fund the transition to digital publishing. But they have a long way to go. Fifteen years after the commercial debut of the Internet, publishers on average still depend on print advertising and circulation for 90% of their revenues. Stop the presses and newspaper companies are out of business. It’s just that simple. Far from being a vote of no confidence, the latest in years of layoffs, furloughs and other stringent economies at Gannett and many of its peers are aimed at staying healthy long enough to build truly robust and sustainable digital publishing businesses. There’s no time to lose. As Frédéric Filloux reported at Monday Note, a just-completed study in France found that news consumers spent 37 minutes a day browsing digital publications, as opposed to 22 minutes a day perusing print. Back in 2000, when the industry collected $48.7 billion in advertising revenues, digital sales were so insignificant that they were not even broken out as a separate category in the data published by the Newspaper Association of America, the industry-funded trade group. The NAA reports that subscription and single-copy sales in 2000 produced another $10.5 billion in sales. Put those two revenue sources together and the industry had $59 billion in revenues from print publishing in 2000. 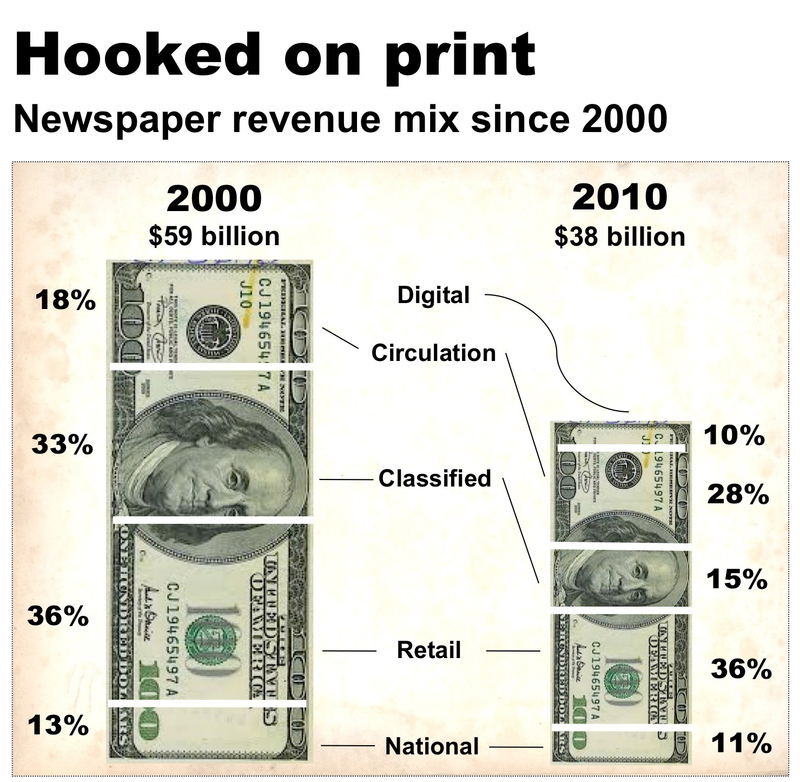 By 2010, print-related revenues dived to approximately $38 billion, or 36% less than in 2000. With ad sales down by 44% in the 10-year period, many publishers chose to offset some of the drop by aggressively hiking circulation rates in spite of a decade-long slide that cut circulation volume by some 30%. Consequently, circulation fees today generate about 28% of total newspaper revenues vs. 18% in 2000. 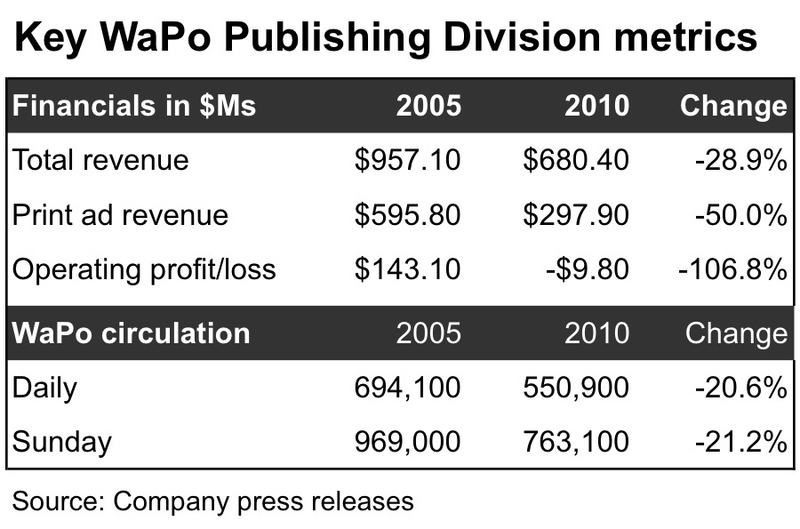 But the shift to circulation revenues from advertising revenues has not reduced the dependence of publishers on print. After more than a decade of struggling over what to do about the digital media, publishers on average still count on print to deliver 90% of their total sales. Digital revenues, which were not even on the radar for NAA statisticians until 2003, were $4 billion in 2010. To make things even more challenging for publishers, the preponderance of digital revenues at newspapers come from packages sold to print advertisers. Prior to the economic meltdown in 2008, digital revenues rose at impressive double-digit levels as publishers persuaded such print want-ad buyers as car dealers, real estate agents and employers to add digital advertising to their schedules. With the economic meltdown and low-priced competitors eroding those categories in recent years, publishers for the most part have been relying almost exclusively on selling banner ads to retail advertisers. The problem with banners is that it they are the lowest form of digital advertising. Because untargeted banners generally have click-though rates of less than 0.5%, marketers don’t want to pay much for them. Prices are further depressed because the web is awash in page views, creating far more inventory than the number of banners vying to appear on them. Last but not least, such big banner-ad networks as Google’s Double Click have learned to squeeze pricing by combining sophisticated bidding algorithms with just-in-time ad delivery. With their legacy Internet ad strategies looking increasingly threadbare, publishers know they have to find bold, new ways to leverage the power of their brands, content-creation capabilities and large local sales teams to win in the digital world. Smart publishers are working on this as fast as they can. Until those new initiatives achieve critical mass, however, print will continue to be the lifeblood of the newspaper business.